Listening to music or making music yourself is one of the most beautiful moments in life for many people. Why should you have to abandon this because of a partial hearing loss? Are you a professional musician? Corrected hearing is of vital importance for your long-lasting career. My knowledge of sound engineering allows me get the best out of your hearing aids and fit them not only in the audiological correct way, but also to your individual listening needs and taste. The above picture shows me when preparing Klangfinder-Samples at my office in Vienna. Sometimes, for customers living abroad, this is a very helpful method to demonstrate different hearing aid strategies. If you are a “newbie”, as far as hearing aids are concerned, then I recommend you try out an ear training period first. Ear training is very helpful and supportive because you forget about listening to different sounds during the phase of hearing loss. Therefore, you will need to be confronted with acoustic stimuli and learn how to process them again before you can turn to sustainable hearing correction. In three weeks, you will learn how your acoustic environment sounds with 100% hearing correction and provide us with insight into your hearing habits. You will get re-accustomed to the acoustic environment and be therefore better adapted afterwards to satisfactory correction. Data analysis that we carry out on the hearing aid will allow me to advise you individually: the analysis will show me which acoustic scenes you come across. With the help of this breakdown, I will show you which technology grade is optimal for your individual hearing loss. Last but not least, over the course of writing your diary you will learn how to express your audio impressions in words. That is also a skill which is going to help you a lot you when subsequently selecting a hearing aid at the artificial head “Klangfinder”. This is because it is not easy to describe sounds and noises. You will often have to think about what causes a sound. Next, what dynamics it corresponds to, and what pitch level you find unpleasant, for example. Training this observational skill is very important for working with me as your audiologist. € 250.- with two modern, high-quality devices for both ears, a training interface for connecting to your Smartphone and 3 sessions over 3 training weeks. When choosing the new hearing aids, I will provide you with professional and extensive support. After a detailed preliminary interview and a hearing test with high-frequency audiometry, we will create your listening profile together. Choose your favourite hearing aid from a selection of eight hearing aids from global manufacturers. The device of your choice will be fine-tuned in at least 4 additional appointments for the various hearing scenes in your daily life. Appointments in your rehearsal or with your own instrument and sound recordings round off the music-specific benefit of the Audienz offer. In addition to the selection with the Klangfinder, you can try out up to 3 different hearing aids and compare them in your everyday life. The 4-year support for device re-adjustment has been recommended by health insurance and is already included in the equipment price. By means of regular servicing and the electronic drying station, you can always be sure that we care optimally for your hearing aids. As a VIP customer, I will personally accompany you to establishing a strong stage presence and by incorporating all of my knowledge in sound engineering. I will give you my feedback regarding your listening habits during the performance. This will also be incorporated into any further adaptions of your hearing aids. Conventional hearing advice is aimed at maintaining speech comprehension with mild to severe loss of hearing. This should help to maintain social contact prevent social isolation. This type of care is, of course, in the interest of the social insurance bodies because it protects against other serious diseases such as depression and social withdrawal. I want more! Every hearing aid is a digital real-time audio amplifier. This can be optimally adapted to the hearing loss in question by means of equalization (frequency processing) and compression (dynamic processing). State-of-the-art measuring systems allow us to achieve optimal sound quality in our high-quality fitting studio in Vienna. 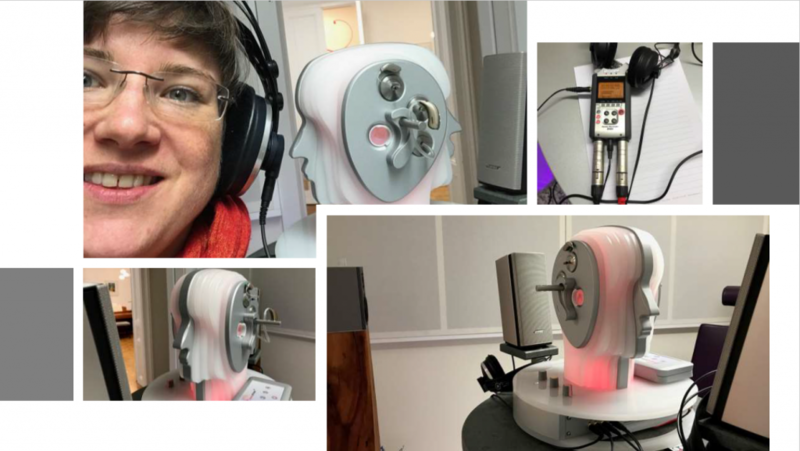 Arrange a non-binding and individual appointment with me to find out about the possibilities and different types of instruments for enjoying music and for listening to it with Klangfinder! Together, we will discuss which package is appropriate for you in your life situation. Please check with your ENT doctor before the appointment to make sure your auditory canals are free of wax (important for an impression) and DO NOT clean them with cotton swabs! You just have to confirm your email address and the 33-page e-book (in German) will be sent to your inbox.